Imagine flawless, elegant design. Imagine smooth, timeless metal. Imagine a signature feature, crafted from one of the most vital elements on planet earth. 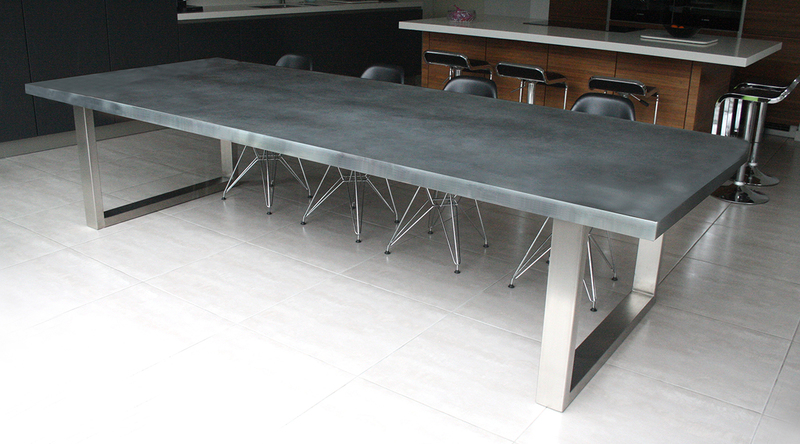 Imagine owning a zinc dining table from Mac&Wood, an essential item for a bold, modern aesthetic. For thousands of years, artisans have perfected the art of smelting zinc, using it to fashion decorative metalwork and raise beautiful, enduring sculptures. Now it’s your turn to bring this elegant material into your home with one of our zinc dining tables. Because its surface fades seamlessly from one colour into another, especially as it ages and gains character, this versatile material will transform even as your interior décor changes over time. Even as your stunning table transforms over time, however, you can always depend on it to create an utterly unique feeling for your living space. Constructed with this durable, dependable element, these contemporary tables are crafted exactly to your specifications. Whether you need space for four people or fourteen, there is room for everyone at any table from Mac&Wood. With clear-cut, brushed stainless steel frames or subtle powder-coated frames, these sensational designs will take your breath away every day. When it comes to living, you don’t have to worry about extensive maintenance. Most spots can be easily wiped away while tougher stains can be buffed out in moments. Zinc truly is an exceptional substance, it’s one that we love to work with time and again. Your table will gain natural hues with every passing year, continually bringing something new to your family’s world. But if you can’t wait that long, you can opt for a natural finish, if you want to be completely blown away when it arrives in your home. Your project is our passion, and we are devoted to the ideals of beauty, durability and excellence in our craftwork. Whatever your preference, a zinc dining table from Mac&Wood is guaranteed to become the stylish heart of your home. Above all else, our tables provide so much more than a place to eat; they create a space for memories, a space to live.